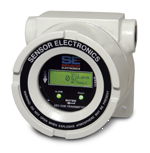 Sensor Electronics combustible and toxic gas detector can be accessorized with the SEC 3500 Operator Interface that has remote web access and can actuate alarm and control devices. SEC 3500 offers an intuitive graphical interface of the entire gas detection equipment system. The SEC 3500 has RS-485 Modbus RTU communication with the SEC 3100 Universal Transmitter. Relay Controllers can be connected to the SEC 3500 Operator Interface. The SEC 3100 Universal Transmitter is explosion proof, has relay options and memory card options. The memory card information from the SEC 3100 can be transferred to a computer via the memory card reader. Also available is a non-explosion proof version called the SEC 3100 DIN Controller. Both the SEC 3100 Universal Transmitter and SEC 3100 DIN Controller are compatible with the SEC 3000 Toxic Gas Detector and the Millenium Gas Detectors. The Millenium gas detectors can be calibrated either for carbon dioxide or a number of different hydrocarbon gases. 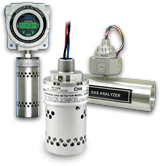 The Millenium combustible gas detection products are performance approved. The SEC 3100 Universal Transmitter and SEC 3100 DIN Controller offer non-intrusive programming and calibration. The SEC 3100 LIM enables non-SEC devices to interface to a Modbus network. The SEC 3100 AIM enables non-SEC 4-20 mA device to interface with a Modbus network. The SEC 3100 ISO Repeater extends the distance and increases the number of devices to RS-485 network.